Expandable and collapsible lists allow user interface designers to fit more content on a smaller screen (like a tablet, a phone, or a watch). These lists don’t have a consistent appearance across all programs. The most common ways to indicate that lists can be expanded or collapsed are with arrows or with plus and minus signs. In Windows® 8 File Explorer, Microsoft® uses different types of arrows to indicate which folders can be expanded and collapsed. · A blank right-pointing arrow indicates that the Desktop, Documents, and Pictures folders can be expanded. · A darkened down-pointing arrow indicates that the This PC folder is already expanded (and can therefore be collapsed). In compiled HTML (CHM) files, Microsoft uses plus and minus signs instead of arrows, as in the following screenshot. When deciding how to describe expandable and collapsible lists, consider your audience. Experienced computer users will understand an instruction like, “Expand the Documents folder” without being told what to click. It is not necessary to differentiate between arrows, plus and minus signs, and other exotic icons. Example (for experienced users): To view additional topics, expand Introducing Windows Media Player. 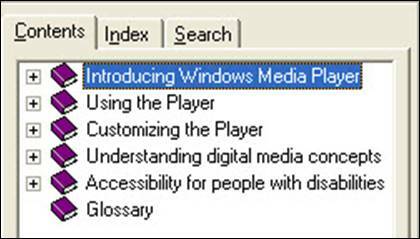 Example (for beginners): To view additional topics, click the plus sign (+) to expand the Introducing Windows Media Player book.